The first man they look for -- and the last man they want to meet. That's Matt Dillon, United States Marshal, bringing law and order to Dodge City, Kansas. When folks come to town, trouble often follows in their wake - young men making rash decisions, old men with old scores to settle, and hired guns with a very specific job to do. 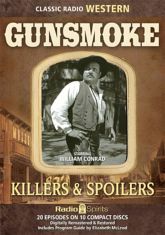 William Conrad stars as Dillon, with Parley Baer as Chester, Howard McNear as Doc, and Georgia Ellis as Kitty. Step inside the Long Branch Saloon for twenty digitally restored and remastered episodes from 1954. Includes a Program Guide by Elizabeth McLeod.